Available from duo to septet. Chris Coull is a very fine trumpet player, and runs many different groups as leader. 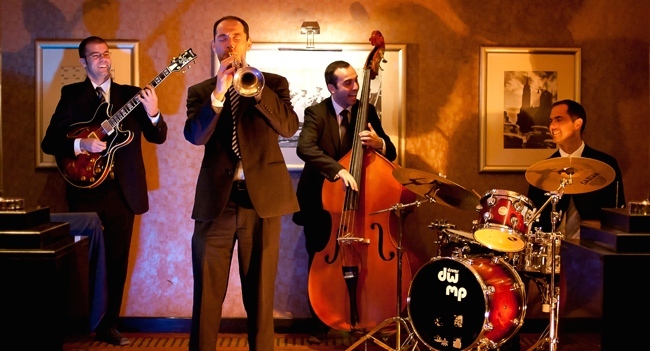 His trios and quartets have been used by corporate clients solidly for the last 12 years. He is also available for weddings and private parties. 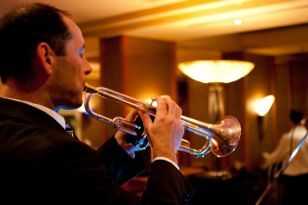 Chris Coull is a highly experienced trumpeter and band leader. He singlehandedly ran the music scene in Doha for the last 15 years, and is now relocating to the UK. In Doha he was the first call for all the corporate work, and more recently, the Jazz at Lincoln Center outpost in Qatar. He ran hospitality gigs for the ATP and WTA tennis tournaments and kept diners entertained at all the 5-star hotels in the Gulf state. Chris’ repertoire is wide-ranging, but his speciality is the jazz standards songbook. 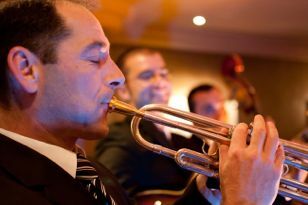 He can play a very mellow flugelhorn for the dinner set and play some hard-swinging trumpet for dancing later on. Chris can be teamed up with most sizes of band: a duo of trumpet and guitar; add double bass for a trio; add drums for a quartet; add sax for a quintet. Chris also has a septet, consisting of trumpet, tenor sax, alto sax, trombone, piano, bass and drums.